Whether I have one drink or ten this weekend for St Patrick’s Day, I always end up wondering which companies I should be supporting. This week’s sustainable stock showdown pits two of my favourite beers against each other. 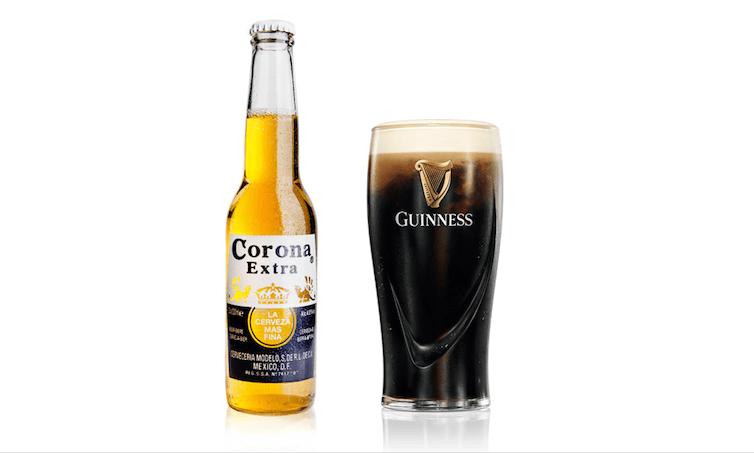 Corona, owned by New York-based Constellation Brands, versus Guinness, owned by the U.K.’s Diageo. So how does owner Constellation Brands stack up on sustainability? Sadly, not very well. They only got one star for sustainability, largely due a lack of disclosure. Reading their Corporate Social Responsibility report, they seem more focused on philanthropy and employee volunteerism rather than deeper sustainability. Sure, they have some great initiatives (a number of their wineries are certified sustainable and their Nava Brewery in Mexico is extremely water and energy efficient), but it leaves me wondering why they haven’t adopted these practices across all of their operations. Constellation Brands’ stock performed explosively well from 2012 until 2018, growing more than 10x. It continued to rise in mid-2018 when they announced a massive $5 billion investment in Canopy Growth, a leading cannabis company. Unfortunately, the stock plummeted with the rest of the cannabis sector after legalization on Oct 17th and has yet to recover. Investors seem worried about the big price tag on this deal, specifically the interest payments on debt that were required to finance the deal. For these reasons and more, we looked far and wide for alcohol companies that are more deeply sustainable and the best one we found is Diageo, British maker of Guinness, Bailey’s, and Johnny Walker (among other brands). Although Diageo hasn’t seen the explosive growth that Constellation Brands experienced, their share price has been rising consistently. 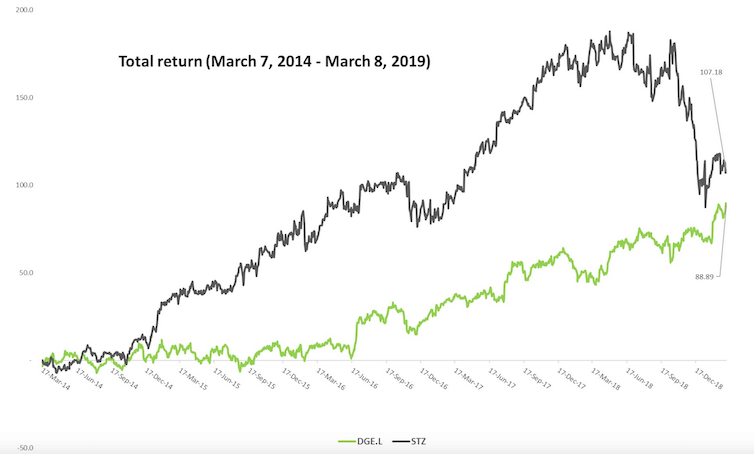 With a higher dividend and lower beta, I expect Diageo to keep growing without the highs (and lows) of the cannabis exposure that has dominated the conversation about Constellation Brands. 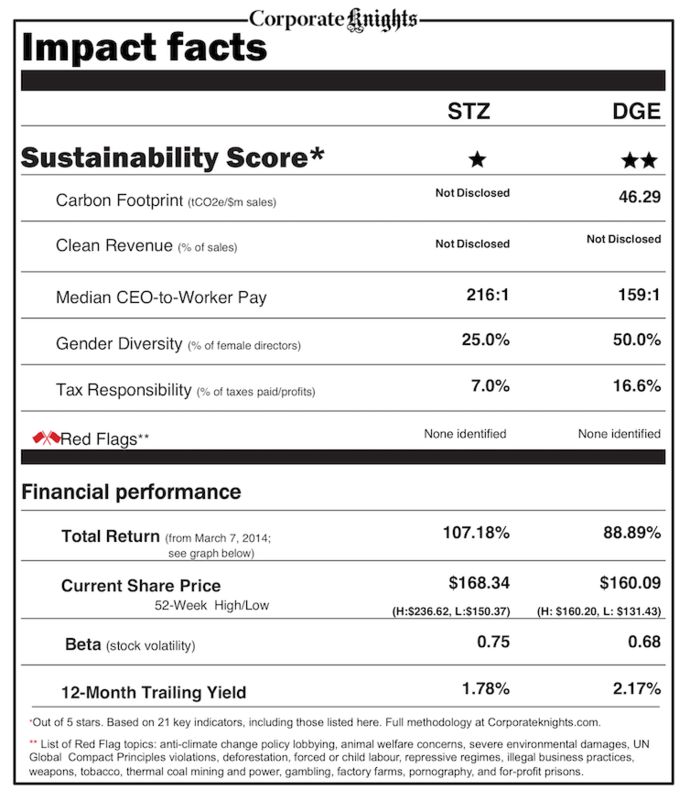 Diageo scores higher on just about every sustainability metric than Constellation Brands. They are much more ambitious in their sustainability strategy, setting strong goals for 2020 including 50% better water efficiency, 50% carbon reduction, and zero waste to landfill. They measure their progress every year and are close to hitting these goals. Diageo also made a commitment to sustainable agriculture with the goal of sourcing 80% of raw materials from local sources. With breweries all over the world, this initiative could have a significant positive impact on farmers everywhere. Diageo says that 10 % of their revenue is currently sourced from organic or sustainable sources. Unfortunately, since the company was unable to provide additional details that would allow Corporate Knights to verify that number, we had to lower their score from four stars to two. But while Diageo still has plenty of work to do in making their operations greener, I’ll be a little bit happier having my coffee with Baileys and a pint of Guinness on Sunday knowing that the company is an industry leader in sustainability.